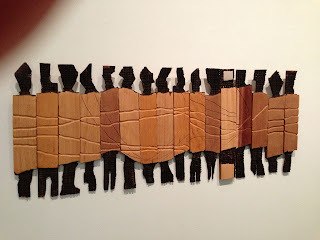 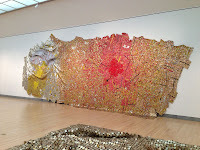 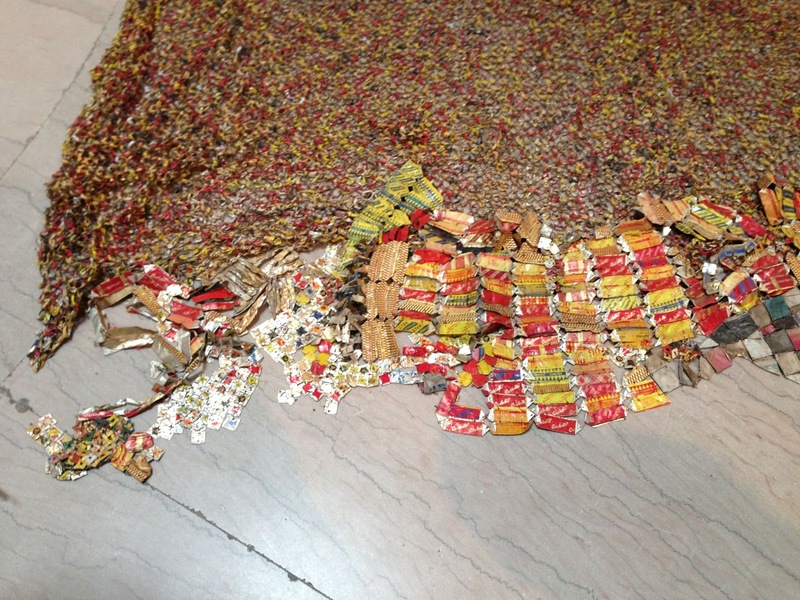 You can photograph the art of El Anatsui on show for one more week at the Brooklyn Museum. 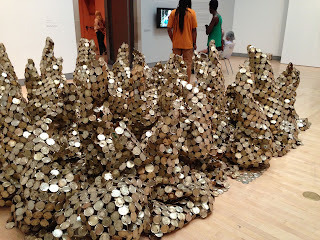 That's not usual for most museum exhibits. By viewing the You tube video shown on the museum's web page you can see how the artist's work welcomes creative participation. 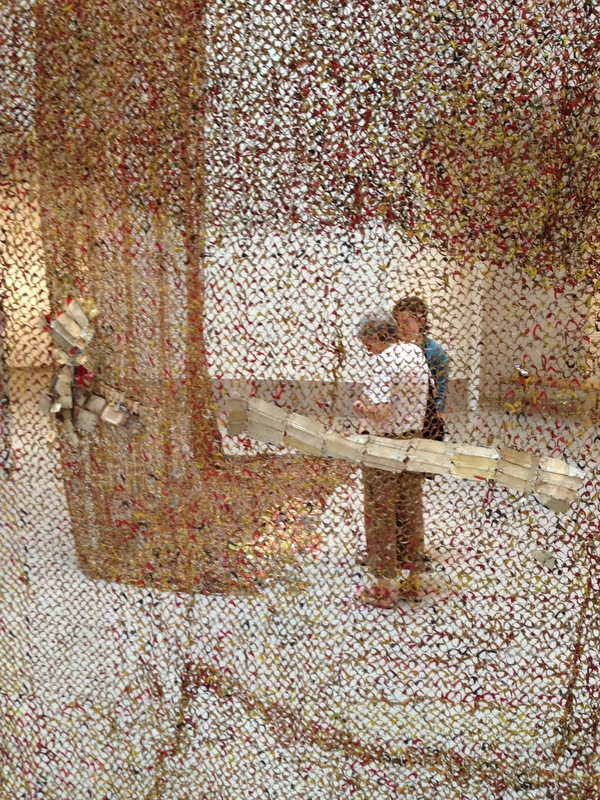 Each exhibit of the hangings will be different. Gravity and Grace: Monumental Works by El Anatsui, invites you to interact by walking around, under, and beside his pieces to further experience of their entrancing detail and large scale. 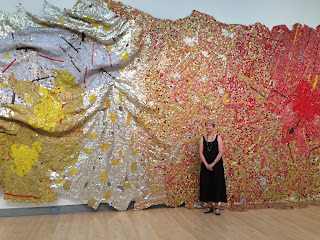 Here I am (for sense of scale) in front of a very painterly one, Gravity and Grace, 2010. 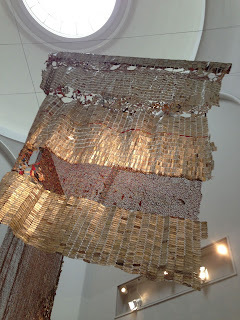 This series of work is made from recycled liquor bottle foil and copper wire. 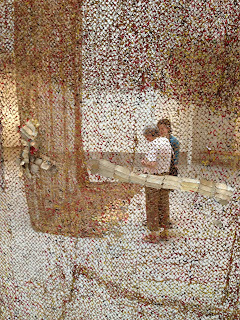 The Ghanaian artist, El Anatsui's fascination with the history of the bottle caps' references transcontinental trade between Africa, Europe and the Americas. 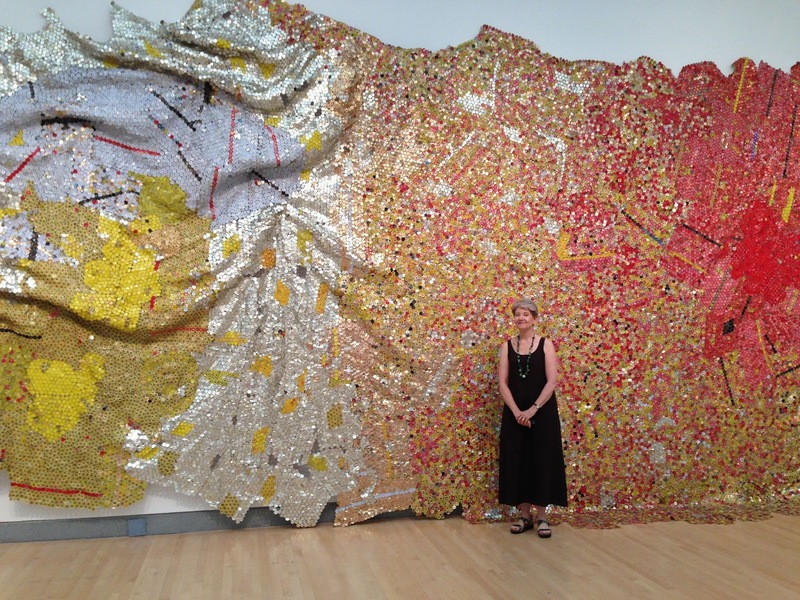 Here's my daughter, Katie Willingham, in front of a more textile-like piece. And one that reminds me of maps with oceans or inlets, some of which spread tantalizingly "off the page." 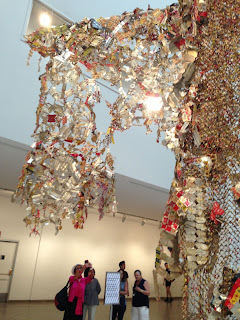 And some made of milk tin lids, wired together. 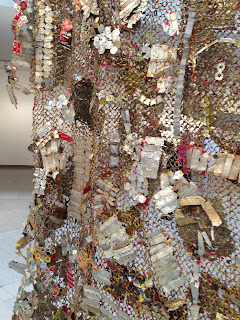 Again, each gallery or museum, may arrange the grouping to their taste. 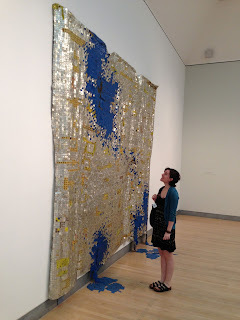 This exhibit is breathtaking! 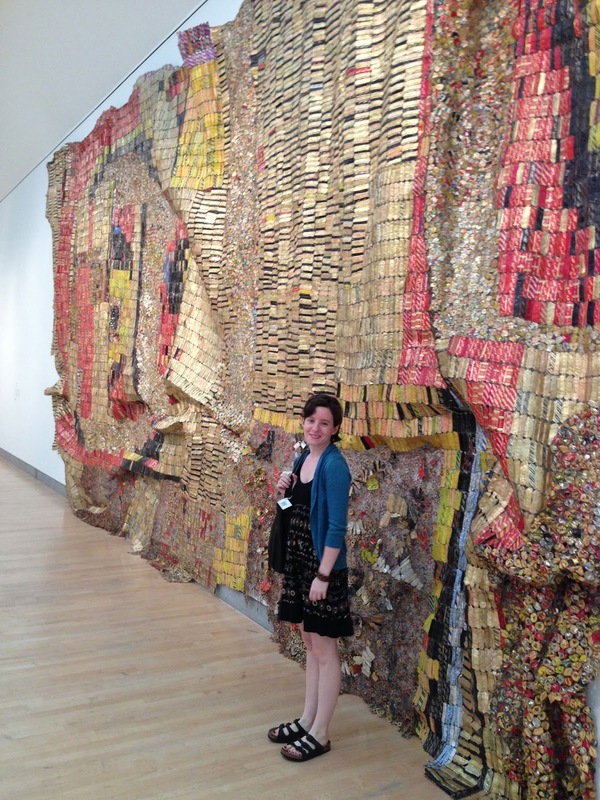 El Anatsui's work will be enriching people around the globe for generations to come! 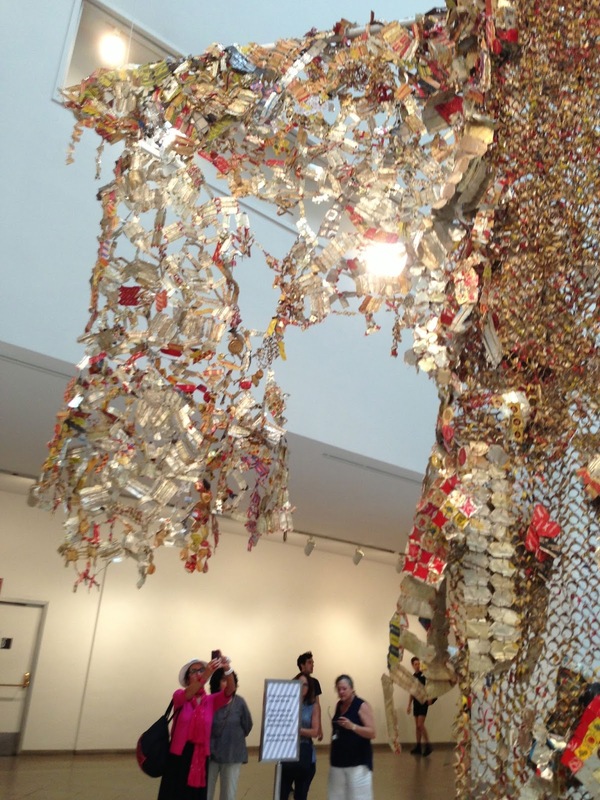 Thanks to the Brooklyn Museum for bringing, hanging and extending this show!